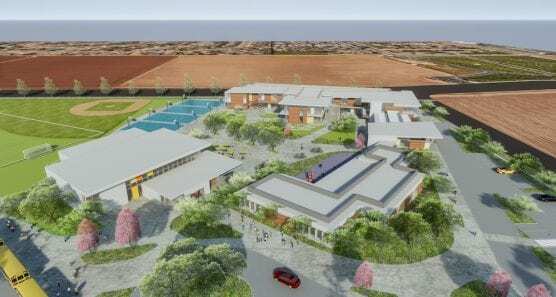 Project rendering of the newest elementary school in Enos Ranch, which is in the Santa Maria-Bonita School District of Santa Barbara County. All photos by DLR Group Architecture. Public works general contractor, Santa Clarita-based AMG & Associates, Inc. (AMG), was awarded the construction project of Santa Maria’s $41M newest elementary school in Enos Ranch by the Santa Maria-Bonita School District Wednesday evening at the district’s board of education meeting. This will be AMG’s second job with the district since 2015. Enos Ranch’s long-awaited project had been in discussions for many years until voters passed Measure T in 2014, a $45M bond measure that eventually turned the conceptual discussions into planning. Construction will consist of three new buildings, totaling approximately 67,700 square feet, 26 classrooms, and will hold up to 900 kindergarten through sixth grade students. In addition to a large multipurpose building, space will be devoted to Therapeutic Learning and Special Education. Two softball fields, a soccer field, and four basketball courts will also be included in the scope of work. Construction is expected to begin in roughly 30 days and complete in the Fall of 2020. In addition to this project, AMG was also recently awarded two separate projects from the San Luis Obispo (SLO) County Community College District: Cuesta College North County Campus R&B Schultz Early Childhood Education Building and the Cuesta College SLO Campus Data Center Project. Construction of the $10.9M Childhood Education Building began in January of 2019 and is slated for completion in May 2020. Construction will consist of a new 10,935 square foot single-story classroom and daycare facility, including all associated underground utilities, earthwork, parking, site work, and landscape. The $5.6M SLO Campus Data Center will consist of a new Data Center Building and all associated underground utilities, earthwork and site work. Construction began in the Fall of 2018, and is expected to complete in the Fall of 2019. These awards put AMG’s total backlog to around $100M—an achievement that reflects the 104% three- year average growth that earned AMG the #3152 spot on Inc. 5000’s 2017 Fastest Growing Private Companies in America, which was AMG’s sixth time on the list. Only 4% of the tens of thousands of companies who have applied for recognition realize such an accomplishment. To learn more about AMG, visit: www.amgassociatesinc.com.